Input selection LEDs Indicate auto/manual select mode and current input: optical S/PDIF, RCA S/PDIF or USB. or '> 24 bits' (24b LED ON pink). Line volume control Controls the volume at the analog line outputs when enabled. Standby/source button Switches between operation and standby modes; also used for manual input selection (momentary press) and LED brigtness. LED brightness Hold Standby/source button down and twist Volume knob to adjust. In the SACD specification there was at one point an amendment to exactly what constituted the maximum permissible DSD signal level. Early SACDs were prepared with a maximum peak signal level of 0dB SACD, whereas a later annex permitted maximum peak levels up to 3.1 dB SACD. So in designing a DSD DAC, we need to accommodate the higher level without clipping, but that means that for DSD recorded in observance of the lower maximum level we are needlessly squandering 3dB of our hard-won dynamic range. So we have provided a setting to allow you to choose how best to deploy the DAC's available dynamic range. 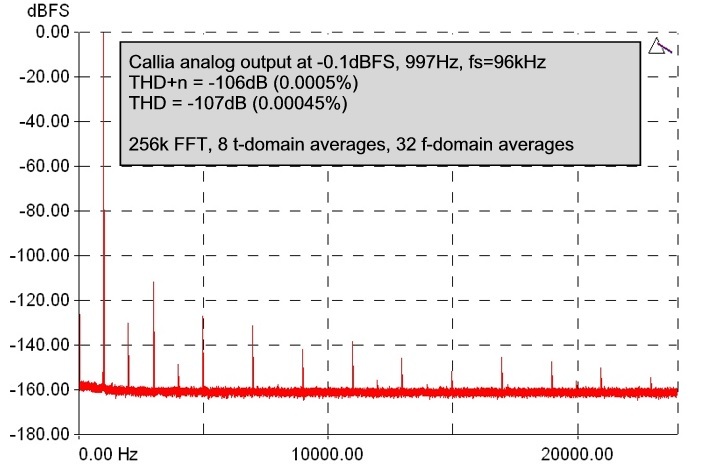 In addition to the DSD64 (5.6448 Mbit/s) and DSD128 (11.2896 Mbit/s) bit rates, Callia also supports the 48kHz-derived rates of 6.144 Mbit/s and 12.288 Mbit/s. At 6.144Mbit/s in addition to the DSD LED, the 48k LED will be lit and at 12.288 Mbit/s the DSD, 48k and x2 LEDs will be lit. (for fs>192k see note at foot of page). Except where otherwise stated, audio performance data are RMS, unweighted, 20Hz..20kHz figures, measured at 997Hz, using fs = 96kHz and '+4dBu' sensitivity settings. 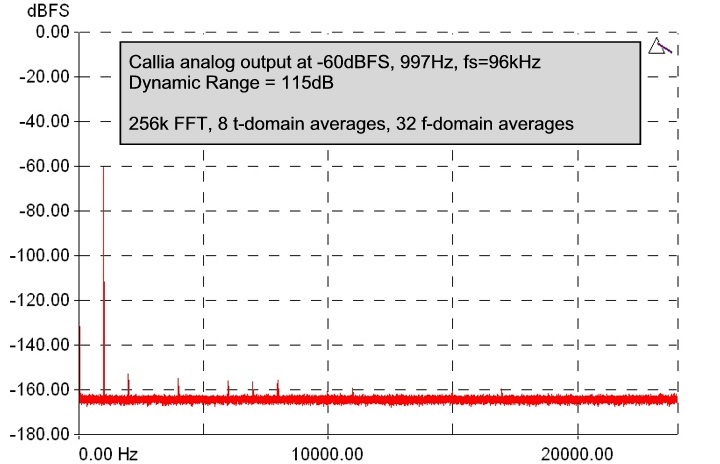 From its USB interface, CALLIA can play audio at sampling rates greater than 192kHz. At these higher rates a proprietary, high performance decimation filter is used to reduce the sampling rate by a factor of 2. For example, 384kHz will be converted down to 192kHz.